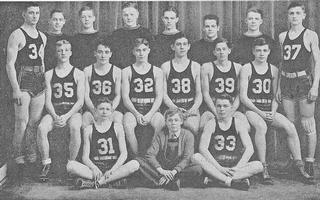 The 1936-37 basketball season was the second and last time that Tomahawk would make a trip to the State tournament. K M Cherry was in his fourth of 16 years as varsity basketball coach for the Hatchets. Coach Cherry would work his magic as he had his team peaking at the correct time as they built on a 6-6 record in the Valley, which was good enough for a tie for 5th place and reeled off four straight playoff victories on their way to State. Major letter winners were Bill Fehrman, Clarence Robarge, Clayton Radtke, Howard Rose, Lloyd Koth, and Harold Sparks. Other members of the high school program were George Fryar, Dave Cowling, Arndt Torkelson, Fred Doucette, Bill Nick, Don Burton, Lawrence Rush, Bill Townsend, Norm Bauer, John Nelson, John Tierney, Jerome Helgeson(mgr), Andy Oelhafen, Howie Hetzel, Lee Myre, Bob Koth, Ed St Peter, Gail Sparks, Joe Chvala, Harold Eittreim, Butch Wee, James Nelson, Ed Ziegler, Luther Polege and Warren Wiley. Howard Rose and Clayton Radtke were selected as All-Conference Honorable Mention. According to the 1937 Kwahamot, Bud Foster was the speaker of the evening as the community paid tribute to the coach and team at a banquet held at the Hotel Tomahawk. It should be noted that Tomahawk qualified for the State basketball tournament in Class B. This was the second year that Wisconsin had a 3 class State tournament and there was no loss of basketball talent from our area. In Division A, Rhinelander lost 28-17 to Beloit in the State finals while St Point was beaten by Beloit 35-33 in the semifinals, Minocqua lost in the Class C State finals by a 33-19 score to Fall Creek and Edgar would win the Class C State Consolation title. Congratulations to the entire team on their successful season as they worked hard to go from a 4-7 record, reel off 8 straight wins and end their 12-9 season at State. How big was this State appearance? Think about this; 67 years later and no other basketball team has been able to accomplish what K M Cherry and some very special Hatchet athletes put together through hard work as a team!